Refractive surgeries have become quite common to eliminate the daily annoyance of glasses of contact lenses. Although LASIK surgery is the most common option, not all people qualify for the procedure. In that situation, PRK may be a viable option. Photorefractive Keratectomy (PRK) is a refractive surgery similar to LASIK that is very commonly used for patients with a thin cornea. During the LASIK procedure, a flap is cut in the cornea. With PRK, instead of creating a flap, the outer layer of the cornea (the epithelium) is removed. Then, the same excimer laser used during LASIK reshapes the cornea to correct its refractive error. PRK is generally considered a safer procedure for patients with thin corneas because less of the cornea is actually touched during the surgery. Patients do also subsequently experience less dryness following the PRK procedure. However, the recovery process is not quite as simple as that of LASIK. Patients will have a corneal abrasion following the surgery that takes about 3-5 days to heal. During that time, the patient will need to wear a soft contact lens that serves as a bandage. 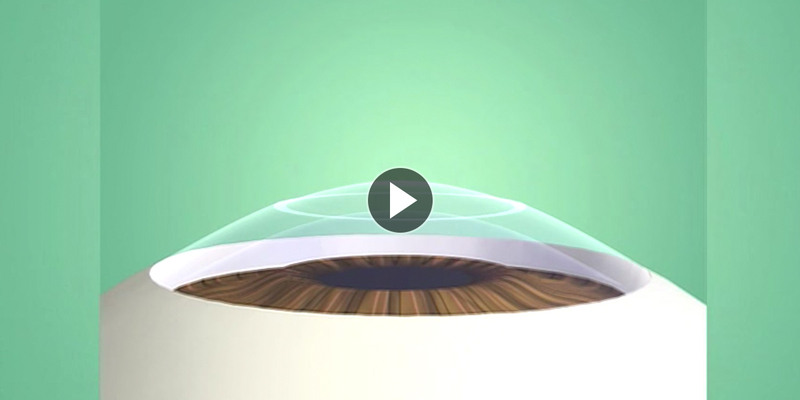 This lens works to minimize pain, expedite healing, and protect the cornea. Moderate discomfort is common during the healing process, and it may take several weeks for vision to clear and stabilize. After three months, visual acuity from either the LASIK procedure or the PRK procedure have been determined by multiple studies to be equivalent to each other.